Bridgend (or Pen-y-bont ar Ogwr in Welsh) is a town in the Mid Glamorgan area of Wales about halfway between Cardiff and Swansea. At just under 50,000 people, its local authority area is nearly three times larger at around 140,000. 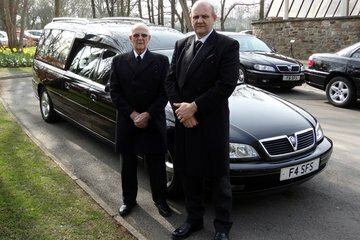 There is a wide choice of funeral directors in Bridgend, despite its small size. There are four funeral homes close to the centre of town, but you will find eight in total within a ten-mile radius. The main cemetery serving the town is Bridgend Cemetery, but there are others at nearby Laleston and Porthcawl, and Coychurch is the main crematorium. Administrators for these facilities will take booking details from family members or funeral directors in Bridgend. Bridgend Council accommodates special burial needs, such as non-denominational and specific religious requirements where possible. Roman Catholic burial needs are facilitated at Sarn and Pencoed, and Muslim interments can be accommodated at Laleston. Porthcawl and Bridgend Cemeteries allow full memorials and all will have a memorial area for the interment of cremated remains. Bridgend cemetery has a chapel that is open to either religious or non-religious ceremonies and there is a large selection of Christian churches within the town. In nearby Sarn, there is a small mosque but many larger centres for Islam and other faiths can be found in nearby Cardiff and Swansea. Search for local Bridgend funeral directors now to see funeral homes near you. You can filter search results by best rated, most reviewed or nearest to you. Click on a funeral director’s listing to see their profile page, where you can read independent customer reviews, search for recent obituaries, and learn more about the funeral services they can offer to you.